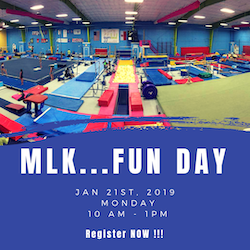 Join us for a fun day at Gymland on 21st of January, 2019 (Monday) ! Lunch: Campers habe the option to bring a lunch or purchase pizza & juice for $5 additional fee. Activities: Gymnastics activities, trampoline, zip line, Gym Ninja course, Cooperative games and fun for everyone! Call us to register and save a spot! Or register Online.